My Mom rarely said things like that to me. She didn’t (and still doesn’t to this day) teach me by telling me what to do. She showed me. She showed me how to be a strong, motivated, ambitious person who isn’t afraid of overcoming obstacles. She lived it. She showed me how to be a generous spirit with unending perseverance and kindness toward others. I may not be a shining example of it all the time, but she taught me by living that way herself. People ask me all the time, “What made you like cooking so much?” My Mom did. I watched her cook and show her love to others through food, amongst many other ways, for my entire life. She still hosts a big family dinner every single Sunday after church, and anybody and everybody is always welcome at the table. Friends and family are so intertwined that you certainly don’t need to be related by blood to be an equal member of the family forever. She throws a graduation open house like it’s nobody’s business. (If you aren’t from the Midwest, you probably have no idea what I’m talking about. You’re missing out.) She is the greatest parent/friend/supporter I can ever imagine. I surely hope that someday I can show all the things I’ve learned from her to a little girl of my own. Anyway, there may not be words to express how I feel about my Mom, but sometimes words aren’t necessary. Actions are better. That’s how Mom did it, and I hope to learn that from her. She taught me everything, because she told showed me so. 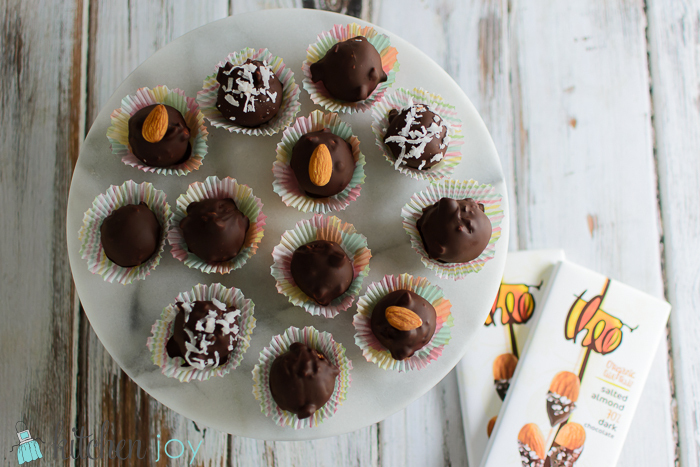 The quest to find the coconut filled truffle is a challenge no longer, since this recipe makes 20 golf-ball sized Coconut Almond Truffles. Enough to satisfy even the most passionate coconut lover, like myself. I have always liked Mounds and Almond Joy candy bars, but never could figure out why there isn’t a milk chocolate version of Mounds. Why do I have to choose between almond and milk chocolate? I want both. As I have gotten older, my aversion to dark chocolate has faded. For this recipe I used a combination of milk chocolate and dark chocolate for the outside of the truffles. In fact, the chocolate bars I used even had bits of almonds in them. A few weeks ago, I received some samples from Theo Chocolate, and I was hooked. Fortunately my local grocery store carries their products now, so I was able to buy some more for this recipe! I like the flavor of the combination of both the milk and dark chocolate. It’s sweet but not too sweet, without being too bitter for the non-dark-chocolate lovers out there. It also helps balance out the sweetness of the coconut filling. I placed a whole almond in the center of half of my truffles, which is entirely optional. 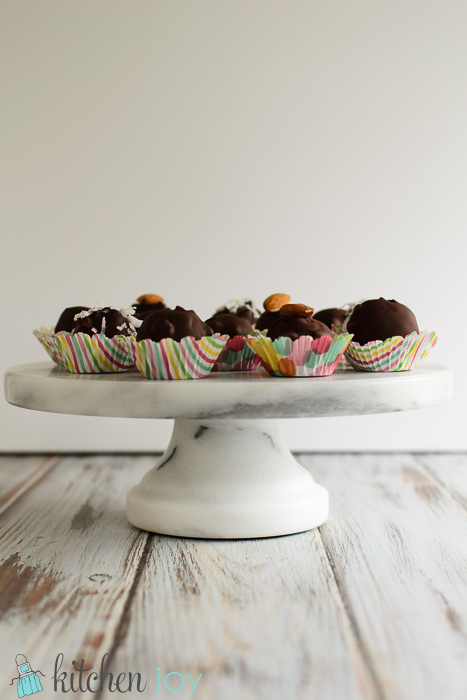 I do recommend that if you’re doing some with an almond inside and some plain coconut inside that you find a way to distinguish them so you don’t have to poke your finger through the bottom of your lovely handmade truffles. 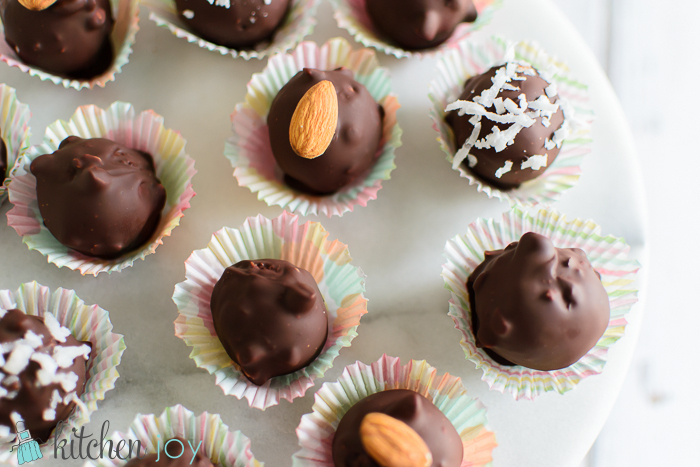 I sprinkled coconut on some of my all-coconut filled truffles, and placed an almond on top of some of the almond-filled ones. Some however, I just left plain on the outside. that’s where mini cupcake liners come in handy. I had polka dotted papers for the truffles with an almond in the center, and striped papers for the all-coconut ones. Beat butter with a mixer or a wooden spoon until smooth. Mix in vanilla, coconut extract, cream of coconut, and salt. Gradually add in the confectioners sugar, mixing until combined thoroughly. Stir in shredded coconut. Chill in refrigerator for at least 1 hour before coating in chocolate. 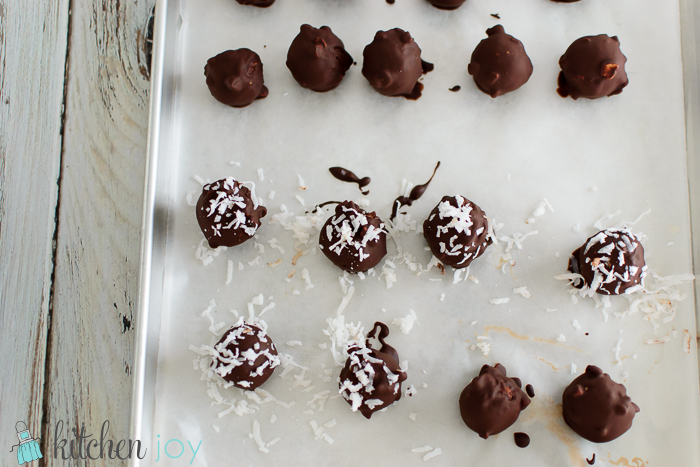 Sprinkle with shredded coconut or top with a whole almond while the chocolate is still wet. Continue process with all remaining coconut balls. Refrigerate until set, about 1 hour. Store in refrigerator. Allow to come up to room temperature a bit before serving. Cream of coconut is not coconut milk. It is available in a can near the mixed drinks ingredients at most grocery stores (it is used when making Pina Coladas). If you shop at a Super Target, they carry it on the baking aisle. Since you only need 2 tablespoons of cream of coconut for this recipe, may I suggest saving the extras so you can make Coconut Cupcakes with Coconut Buttercream? They're phenomenal.